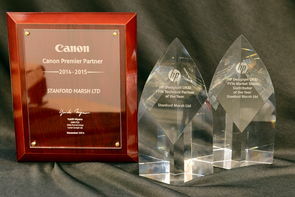 Stanford Marsh Group (SMG) are delighted to announce winning three awards in the wide format sector. SMG Director Adrian Painter was please to accept two awards from HP at their Partner conference in London, for the largest Market Share Contributor of the year and Designjet FY14 Technical Partner of the year for UK & Ireland. Adrian received the award from Phil Oakley UK Designjet Manager and Thomas Valjak Vice President & EMEA General Manager of Large-Format Printing. Separately Matthew Perkins (Co-Director of SMG) accepted on behalf of the company UK Premier Partner status from Canon Wide Format. The award was presented in Istanbul Turkey by Mr Miyano Managing Director for Canon Wide Format Europe. Making Stanford Marsh one of only 18 premier partners in Europe. Adrian Painter commented that these three awards demonstrate the breadth of our product range and the info structure of our business which allows us to support multiple brands without compromise. 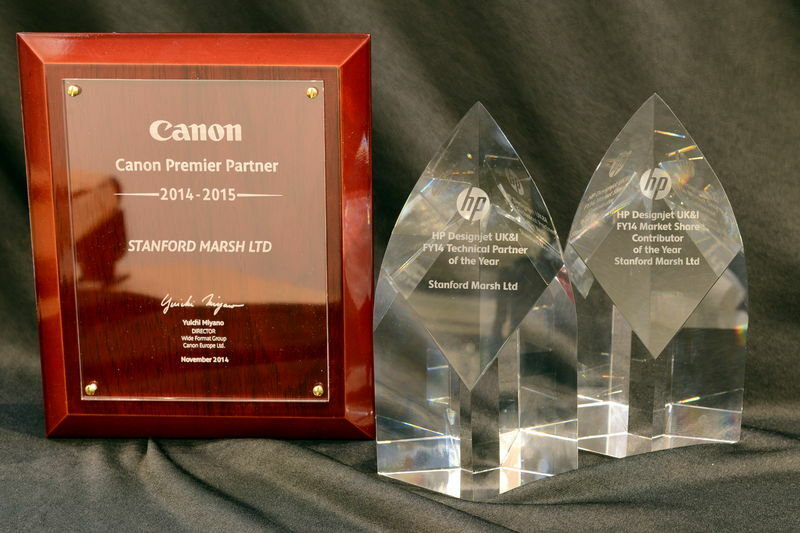 We have won successive awards from HP over several years and we continue to develop our working relationship with both HP and Canon.